Is the creative life fundamentally selfish? 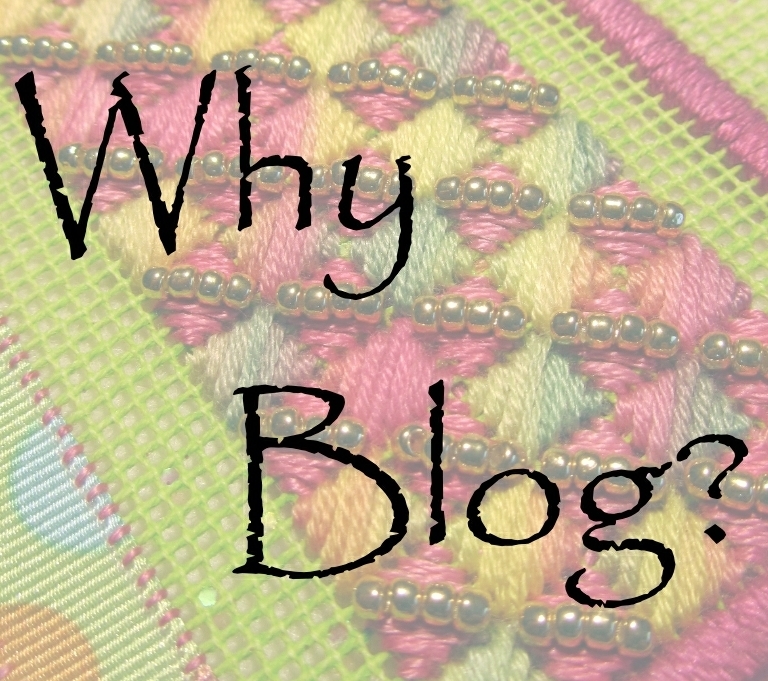 I have a new favourite blog – The Textile Blog by John Hopper. I only had to read one post and I knew that I would find the kind of material that I love to read. The reason I like it is because it does more than leave me with a “That’s nice” or “Huh, interesting” kind of feeling. Instead it leaves me thinking – really thinking – about this creative life I have chosen to pursue. And the question I found myself pondering today was, “Is the creative life fundamentally selfish?”. Now there’s a question for you. Does my choice to live a creative life mean that I am selfish or self-absorbed? The obvious answer to that is,”I hope not!”. “So why pose the question?”, I hear you ask. Well, it was triggered by this article entitled “Creative Art as the Sharing of Personal Insight”. It opens with the idea that being involved in the creative arts is sometimes judged as being a form of selfishness, or hedonism, or self-absorption. This really struck a chord with me because I sometimes find it hard to explain to people why I chose this fork in the road. Why am I not the career scientist everyone thought I would be when I was younger? Why have I chosen instead to pick up fabric, needle and thread? And indeed isn’t this latter path somehow “a bit frivolous”, and perhaps even “worthless” when compared to a scientific career? And the natural outcome of all those questions is that sometimes I do feel a bit selfish as a gleefully follow my passion every day and have the joy of absolutely loving what I do. Thankfully, John provided me with the perfect antidote to these doubts. He explains that “creative art…is about the cycle of absorption and exhalation”. This is the idea that all creatives absorb inspiration from a myriad of sources (both conciously and unconciously), pass it through the lens of their own unique experience, personality and skills, and then exhale something new. And why is this a good thing? In my humble little corner of the creative world I will gladly take on this philosophy. But I think it goes a little further than that…. at least for me. 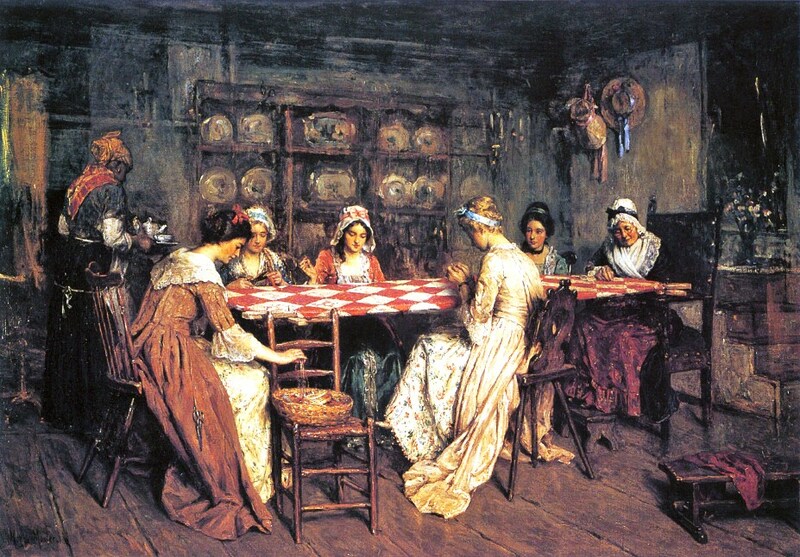 In my weekly patchwork group we have built a very strong community of women who came together originally because of a shared passion for quilting and patchwork. But the ties are now much more than that. We take care of each other when life throws up problems and obstacles; we share joy and excitement in new achievements or milestones; we share the fruits of our labours with family and friends; and we have developed a strong community culture of giving back. Our main community project is to make quilts for foster children. Twice a year we deliver upwards of 30 quilts for children in foster care. The idea is to make sure that each child has a special quilt which is just for them to keep. It is not going to solve the big underlying problems that have put them into foster care, but it hopefully brings a little bit of love and comfort to otherwise pretty tough times for them. 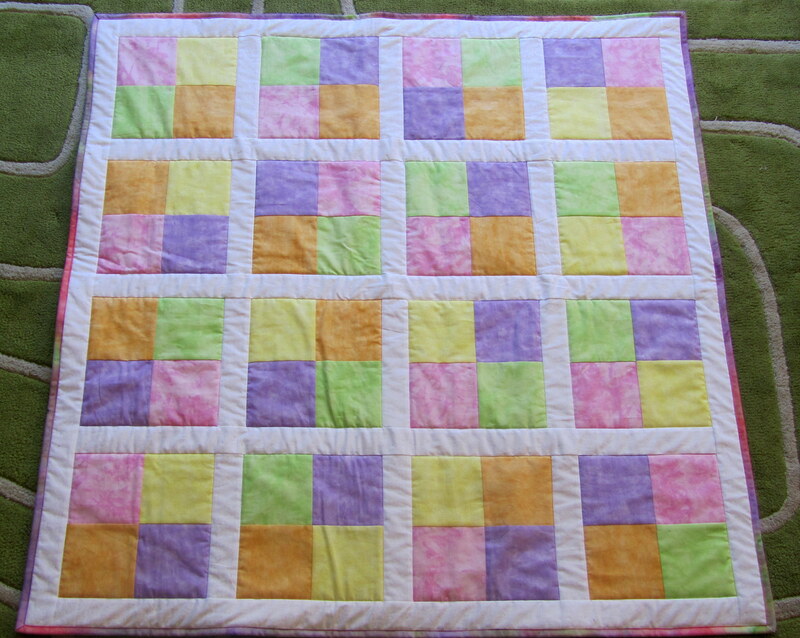 A simple quilt made for foster children from donated squares of fabric. There are countless groups, just like ours, all around the world. They serve a very important purpose beyond the obvious one of providing a venue for a creative craft to be practiced and shared. These groups become communities where participants (generally speaking) take care of each other. It might just be a warm hug on a down day or the offer of real assistance when illness or family crisis strikes. And in many groups, that caring is soon extended to some sort of charitable endeavour. Just imagine how much poorer our world be without the contributions of this everyday creative work. So do I really feel selfish as I pursue this creative life? No. Rather I feel lucky and privileged to be a small part of a worldwide movement that does a whole lot more than just “play” with craft. Sometimes, it is all about the pure wonder and inspiration that John Hopper describes in the creative process. At other times, it is just about sharing some love and compassion with a little generous creativity in an otherwise busy world. 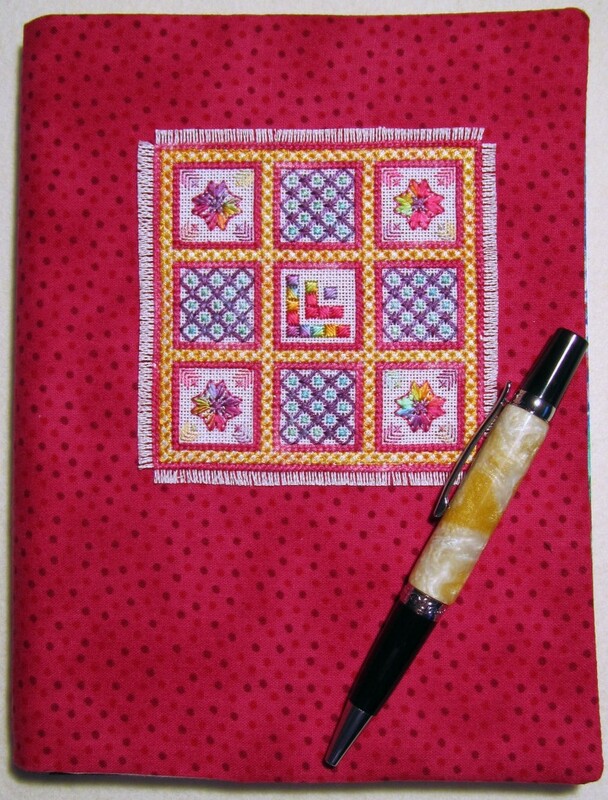 Sharing a little piece of everyday creativity – an A5 journal cover embroidered for a friend. Where does the time go? I have been busily travelling over the last few weeks and have so much to share with you all. First, at the end of September I headed to Adelaide for the Beating Around the Bush embroidery convention. I will write more about this in future posts, but for now it is sufficient to say that I had a wonderful time and learnt so much. And then almost as soon as I was home from BATB, we were on the road to beautiful Denmark in the southwest of Western Australia for a wonderful week of relaxation with family and friends. 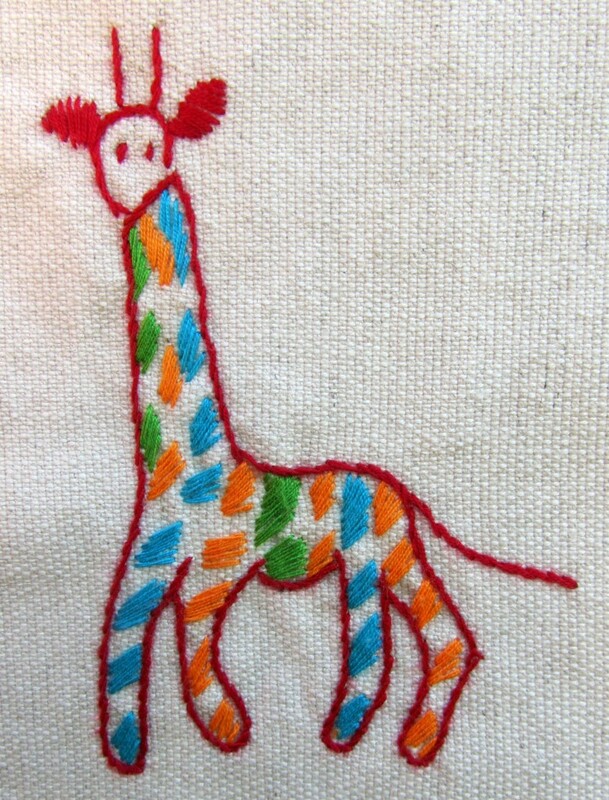 I talked embroidery a lot with my Mum (as we always do) but barely put a stitch in anything for a week. Instead, I kayaked, hiked, biked and swam until my muscles ached. 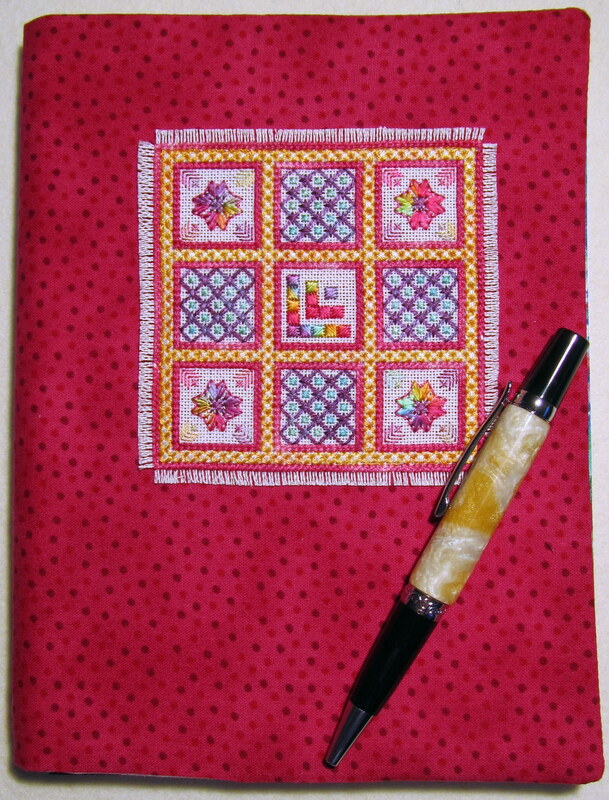 It was great to take a complete break from my sewing and creativity, and to give my brain a rest from thinking so much! 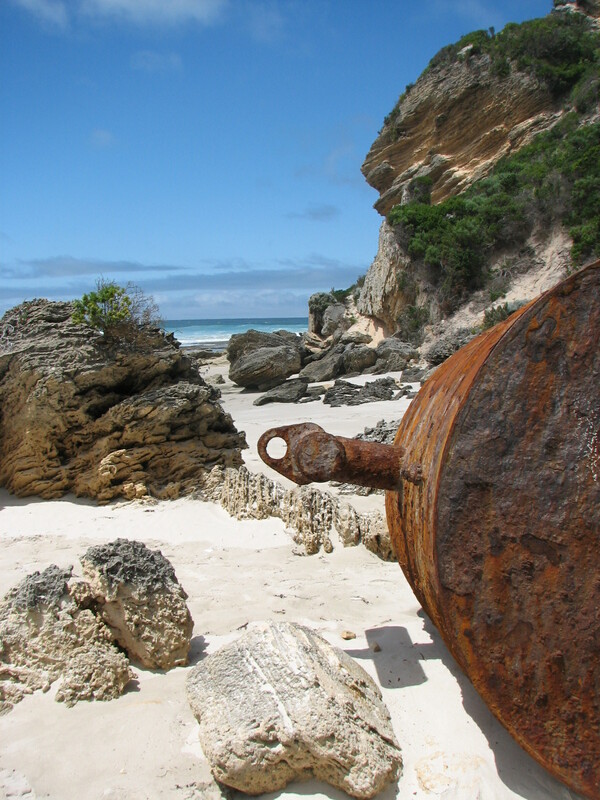 Beautiful beach near Denmark, Western Australia. Now that I am well and truly back on deck I am working on tidying up my workspace (again – why does this job never seem to go away 🙂 ). 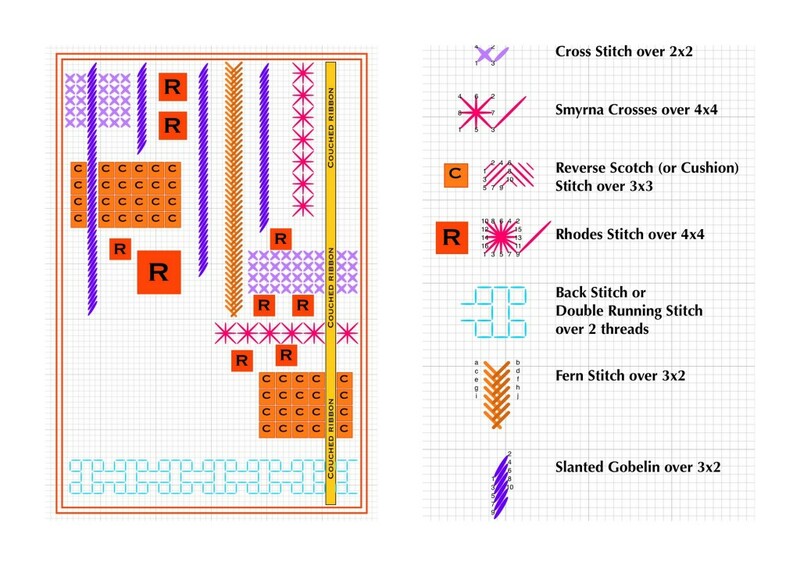 And I have come back from BATB with a new and exciting perspective on the best way forward for Beautiful Stitches. I’ll write more about that in a special post next week, but in the meantime it got me thinking about the creative process again and I wanted to share the following little bit of insight with you all…..
Uri recounts that whilst studying for his PhD, his research became stuck – he simply couldn’t see a way forward, and in the scientific world this felt like failure. And the more he asked around, the more he realised that fellow students were experiencing the same thing. Scientists report their findings as a direct line from question to answer; a completely objective pursuit with no room for subjectivity and emotion. The absolutely key point is that they only report results – not process – and thus if your research is stuck and not producing results, then you feel like you are failing. And yet, of course science is not like this at all. In common with many other fields of endeavour it encounters false starts, road blocks, hiccups, and diversions. But if you are lucky, what started off as a journey from Question A to Answer B, may actually lead to a completely new and unknown Answer C.
Uri now counsels his students to expect the process of research to be messy (think Austin Kleon here too – “Process is messy!”) and he has two key tools to help them. First, when they get stuck he describes it as being in “the cloud”. This is not a scary or bad place to be, even if it is frustrating and sometimes depressing. Rather it is an opportunity to try something new, different, creative, playful, etc to find a way out of the cloud. Second, you need someone to keep you company in “the cloud” – one or more supportive collaborators. And these people have a very important job to do – they need to say “Yes… and” (a technique Uri learned from taking part in improvisational theatre classes) – never “No”. “Yes… and” encourages people to keep exploring and being creative, whereas “No” simply makes you stop and feel defeated. I love the fact that Uri’s video reminds me that I don’t need to be scared of the “messiness” of the creative process. As someone who comes from a very traditional scientific background in physics and maths, it can sometimes feel like I am jumping around in a very haphazard way as I flit from idea to idea, trying one thing and then moving on to something different. But you do sometimes need to do this – to go exploring in “the cloud” until you find that thing that goes “Aha! – this is where I wanted to be”. And you really need to find those supportive friends to keep you company along the way. When I was in Adelaide I caught up with wonderful friends, some whom I hadn’t seen for over twenty years – since we were all at University together. It sounds scary but actually it was fantastic! Most only knew me as the science student I was in my late teens and at first glance my switch to a creative career in textiles might have seemed rather odd. But these friends were wonderful – there were “Yes…and” conversations going all week to the point where my head was so full of ideas I simply couldn’t hold any more (hence the need for all that kayaking and hiking). So, I have learnt a really wonderful lesson in the last few weeks. Be open about what you do – share it with everyone and don’t be afraid to let people know when you are stuck in your “cloud” or going round and round in circles. And then listen out for the “Yes… and” conversations – you might be surprised by just how many there are and the odd sources that they come from. My friend Greg has been allowing me to delve into his textile collection once again. 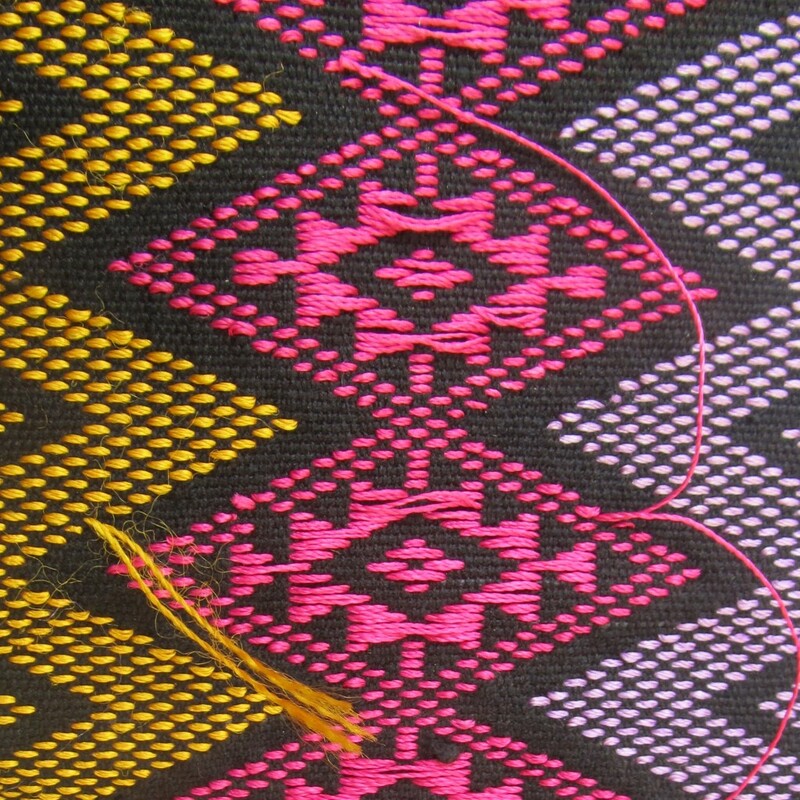 Like the Akha cross-stitch I showed you earlier this year, these pieces were purchased in Myanmar. One is a modern piece, and the other is about 100 years old. Greg asked me to have a look at them and see what I could find out about how they were made. 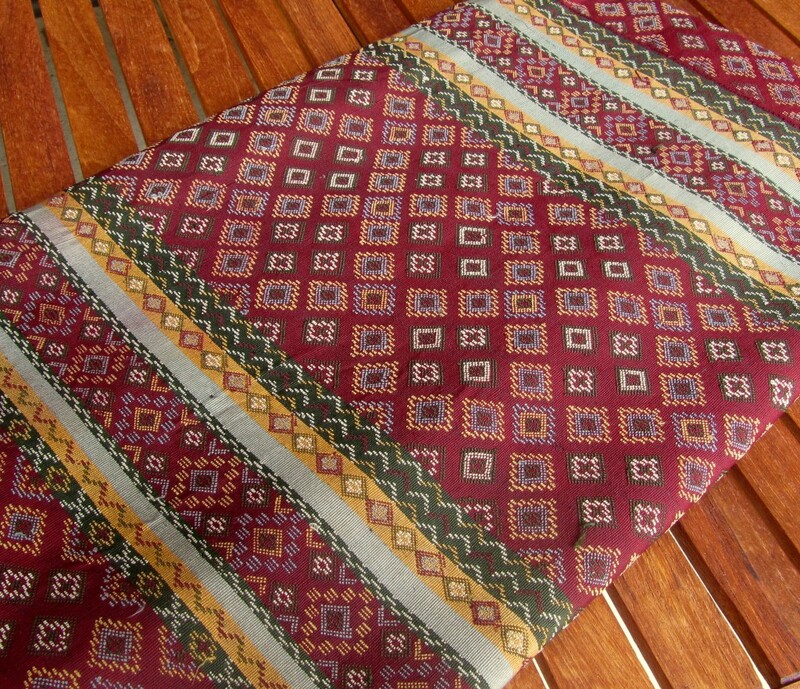 Part of the modern textile from Myanmar. This brightly coloured cloth is woven from black cotton with a rainbow style geometric pattern in rayon thread. It has been woven as a single piece and measures approximately 105cm wide and 190cm long. 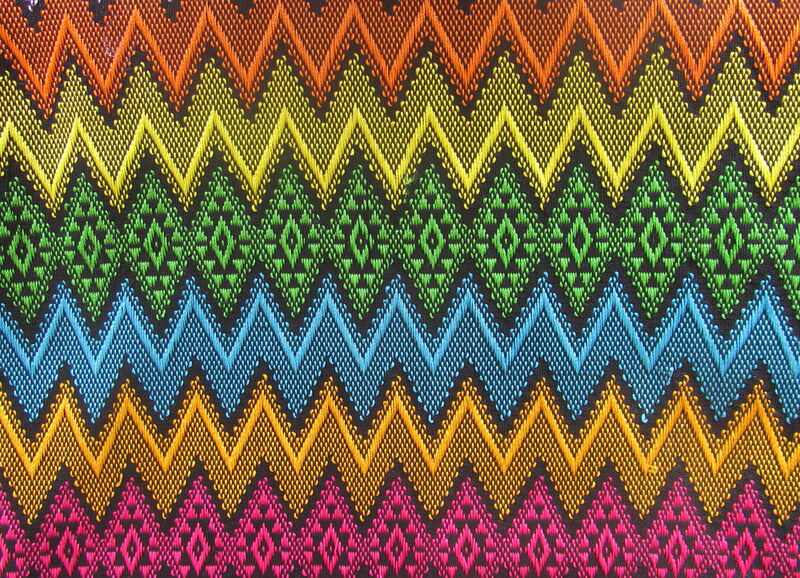 The colour palette cycles through green, yellow, orange, purple, pink, dark yellow, and blue, and the design is composed of zig-zags and diamonds. The colours are just lovely and I can easily imagine this piece of cloth hanging up in Bogyoke Market in Yangon where Greg purchased it. 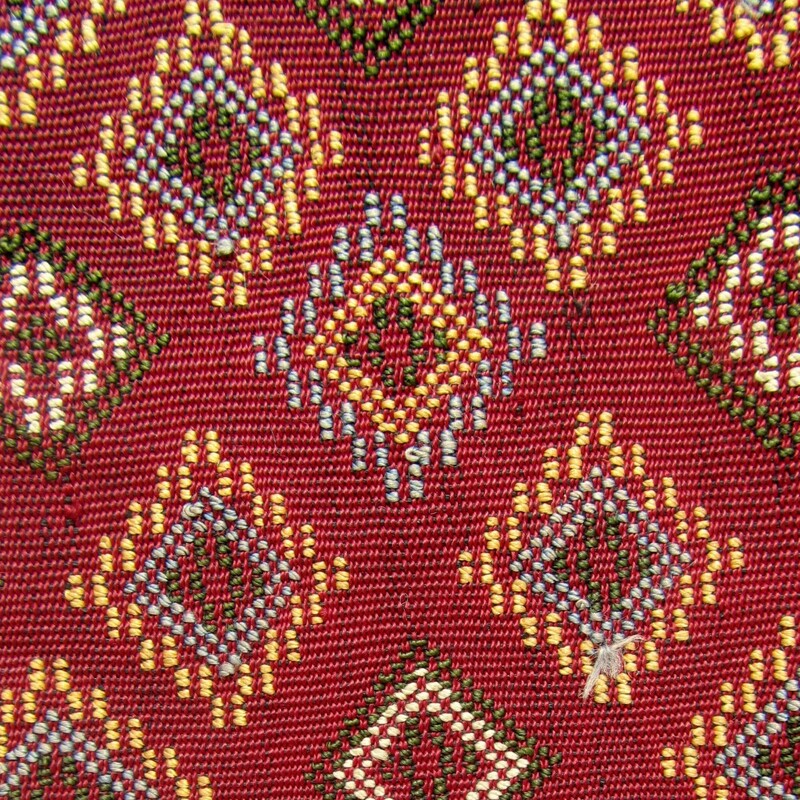 Detailed view of the front of the fabric. The long axis of each diamond measures 6cm. 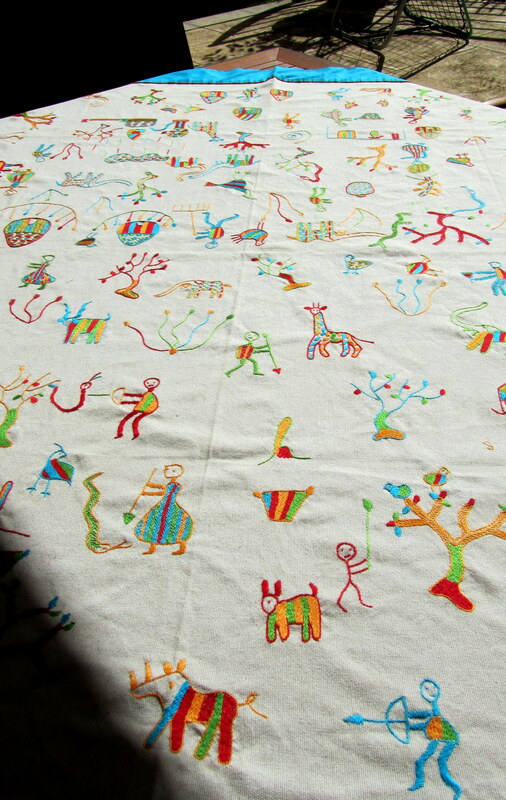 Detailed view of the back of the fabric. Note that this is the reverse of the pattern on the front of the fabric. A clue to its construction can be seen in these detailed photos of the front and back of the textile. The diamonds on the back are a reverse image of those on the front, showing how the colourful rayon thread has been carried across the front and back of the black cotton ground. You can also see on the front of the design where the rayon thread is turned to continue working each row of the design (the angled “stitches” as opposed to the horizontal “stitches”). The antique fabric is quite different to the modern piece. It was made by the Chin people who live in western Myanmar, northeastern India and Eastern Bangladesh. 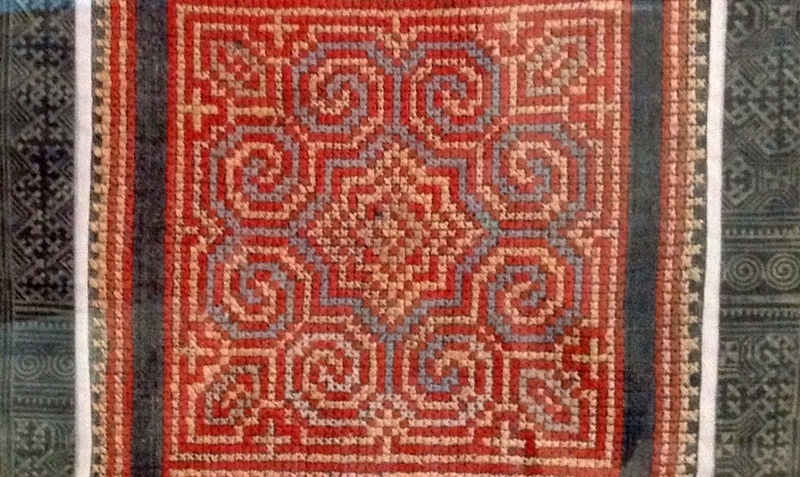 In the book “Mantles of Merit” by David W. & Barbara G. Fraser there is a picture of a very similar textile on Pg. 125 which is attributed to the Haka area in Western Myanmar and dated 1923-1933. Antique Chin weaving, estimated to be approximately 100 years old. The detail of the design is very fine – breathtakingly so in fact. 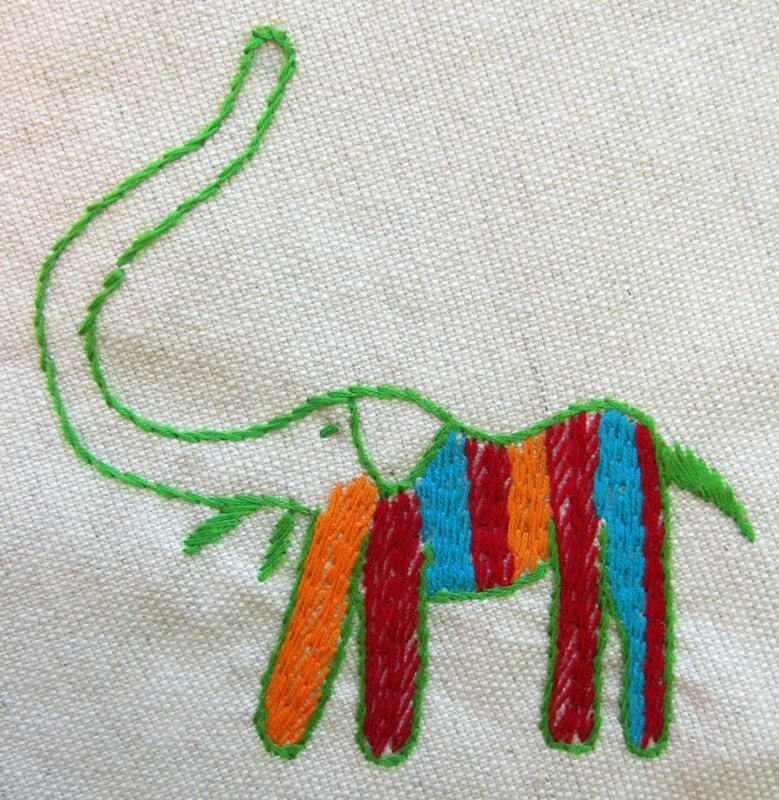 The fabric is made of a cotton ground with the fine geometric detail worked in silk thread. Hours and hours of work would have been required to create such fine geometric detail. 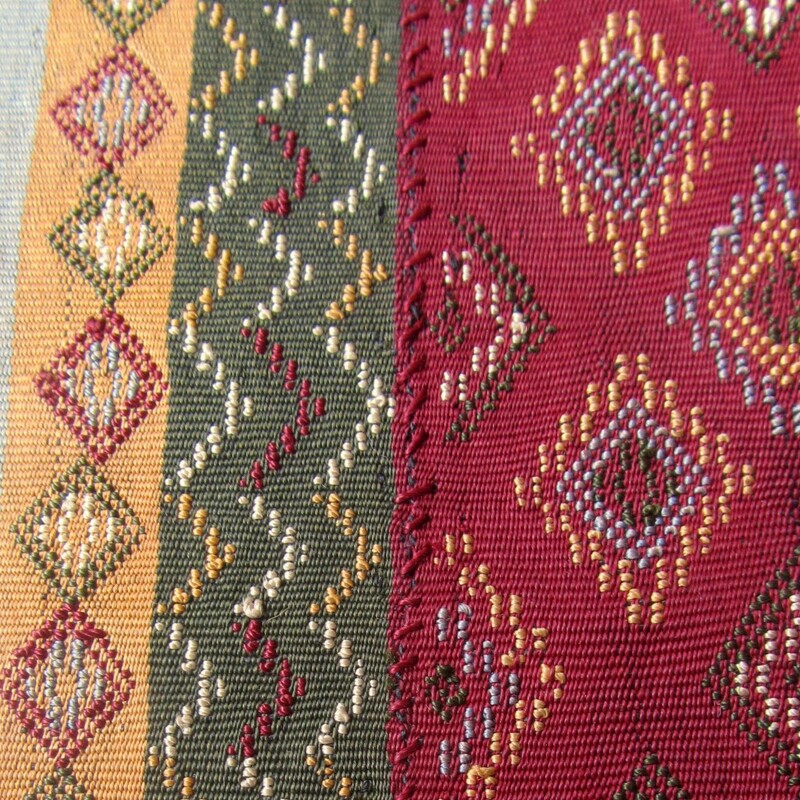 Detailed view of the front of the weaving. Each diamond here measures just 1.5cm along each side. And almost as fascinating as the front, the back shows the forest of starting and ending threads for each of the little geometric motifs. Detailed view of the back of the Chin weaving. Finally, close inspection reveals that this piece was worked in two loom widths and then carefully joined. Until I knew from the Fraser’s book that I needed to search for a join, I didn’t even know that it was there! Close-up view of the join in the Chin weaving. 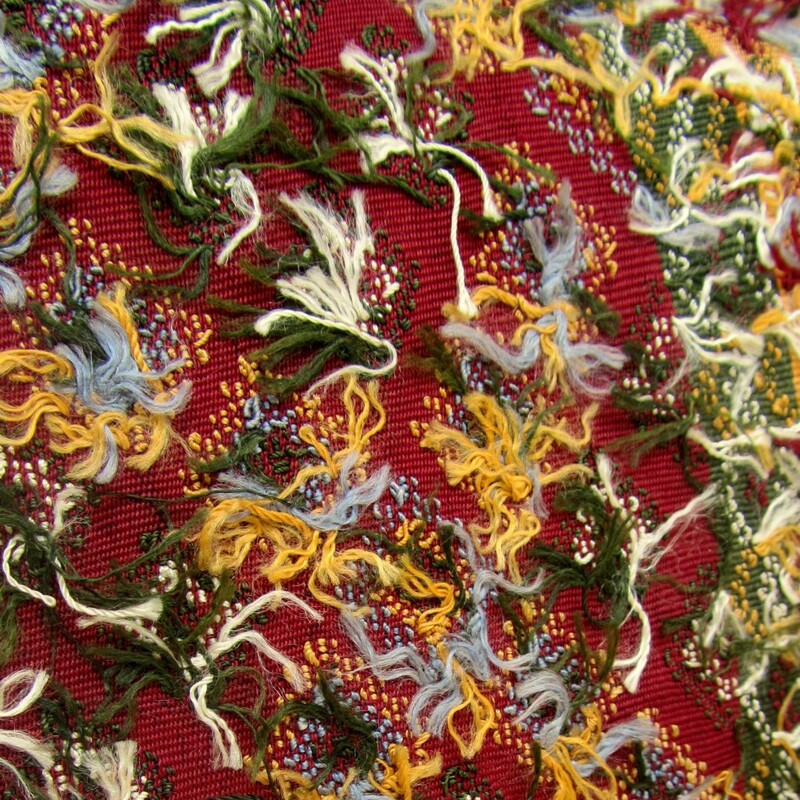 So, how were these gorgeous textiles made? They are both examples of discontinuous supplementary weft weaving. Basically this means that the pattern is woven into the fabric by the use of extra threads (supplementary weft) which are not continuous across the width of the fabric (hence discontinuous). 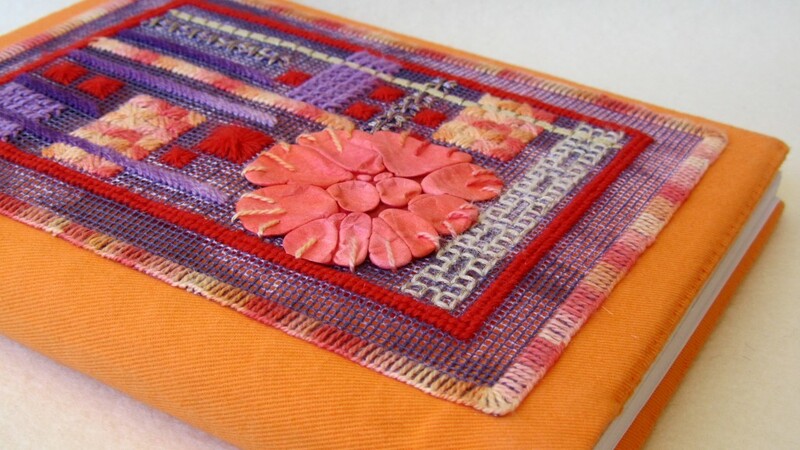 You can see a great picture of this type of work in progress on Kay Faulkner’s blog and also find out more about how to do this type of weaving at Backstrap Weaving. I found myself really fascinated by these fabrics because my background as a canvaswork embroiderer initially made me look at these fabrics as though they had been embroidered. 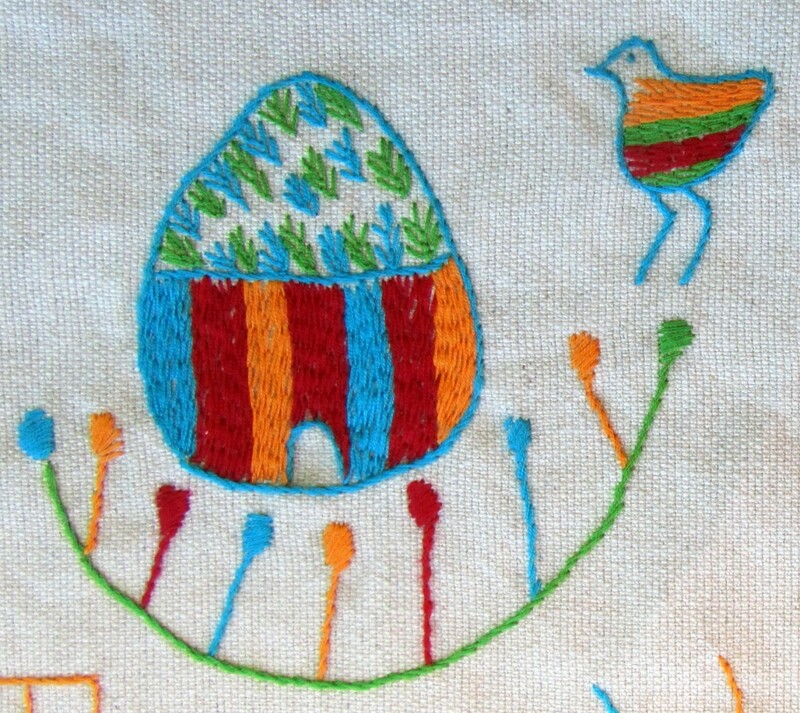 The colourful geometric designs echo the shapes and colours that I love to play with in my own embroidery designs. I imagined someone painstakingly working the modern piece in much the same way as I am working on a piece of Kogin embroidery at the moment. And as for the Chin piece, the possibility of it being embroidered blew me away because it was just too impossibly fine. But then I felt the same about the Afghan embroidery I wrote about in February this year and that was most definitely hand embroidered – so anything was possible. As it turns out, both pieces are woven and the skill required to manipulate the supplementary weft threads is just as daunting as embroidering complex geometric designs with a needle. Of course, you could embroider these designs if you wished, but at this scale it would be incredibly time consuming and impractical. But there is something eminently satisfying about learning from one craft to inform another. Historically, needlepoint evolved to mimic large woven tapestries. 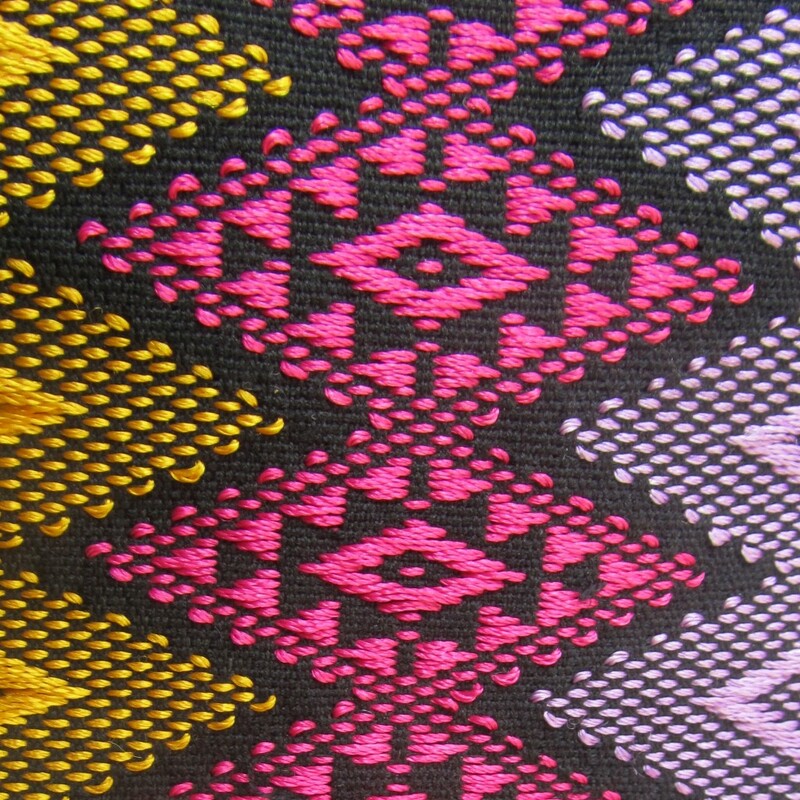 I love the fact that these gorgeous textiles from Myanmar will provide similar creative inspiration for one of my embroidery designs in the future. I caught up with a fascinating documentary on BBC iPlayer this week called “The Secret World of Haute Couture” by Margie Kinmonth. It was produced in 2007 (so has been around for quite a while now) but I found it absolutely fascinating. And I now have a completely new attitude (and respect) for what had seemed to me previously to be something rather frivolous. The Chanel Haute Couture Fall/Winter Collection in 2011. So, the full extent of my fashion knowledge is derived from what I have briefly gleaned from flicking through magazines in the doctor’s surgery. My knowledge is meagre to say the least. And I confess that I was pretty prejudiced. I would look at elaborate creations on the catwalk and think to myself, “Who on earth wears this stuff? What is the point?”. Until I saw saw this documentary….. The “haute couture” label is protected by law in France. Of course, it is often used to describe “high fashion” in a wider sense, but strictly speaking the Chambre Syndicale de la Haute Couture includes only those companies who have been granted the designation “Haute Couture” by the Chambre de Commerce et d’Industrie de Paris. The label is reviewed annually and depends on a rigorous set of criteria. The key points are that haute couture pieces are designed to be one-off garments, exclusively tailored to fit one person, and made by hand using the very finest materials. 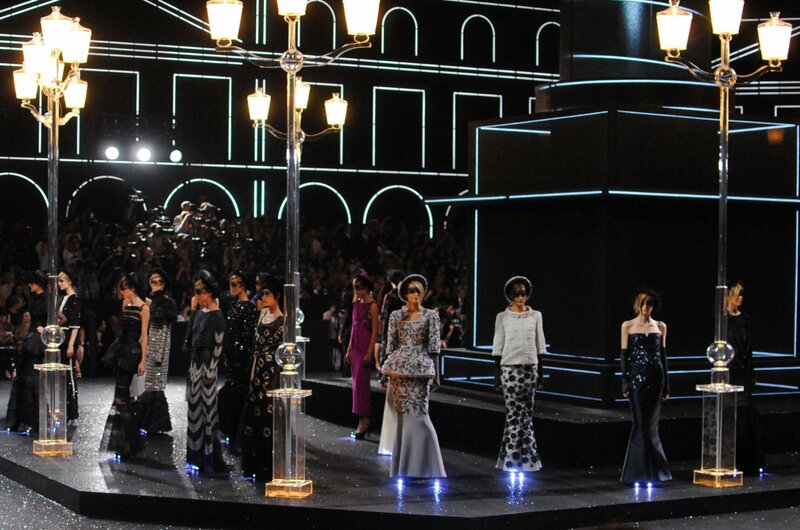 Qualifying fashion houses must also present a full collection of haute couture garments at two shows per year. Some of these garments are exquisitely beautiful, others ugly, and some frankly quite bizarre. A price tag of US$100,000 (or a lot more) for a single dress is quite normal. But what I have come to realise is that each and every garment is a work of art, painstakingly created by highly skilled craftspeople who put hours and hours of hand work into each unique design. An outfit from the 2010 Spring/Summer Collection by Khaled el Masri. 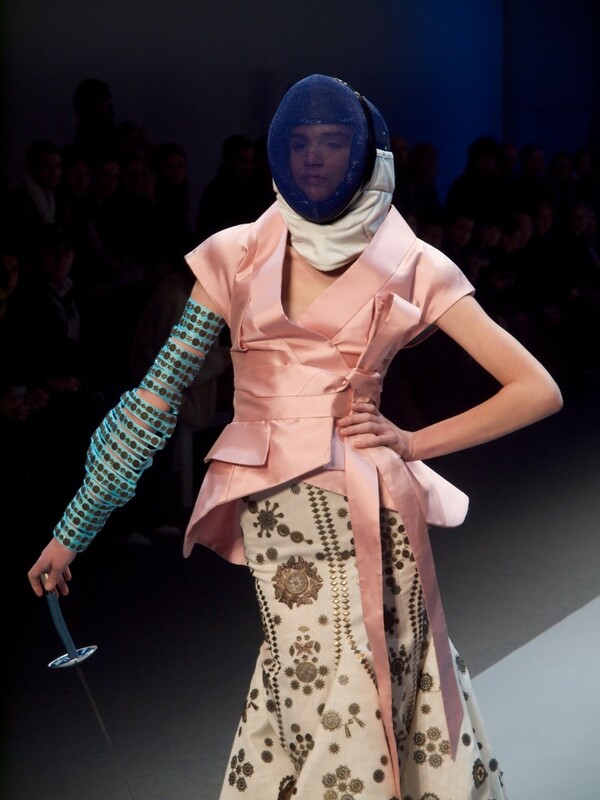 For example, the outfit pictured above by Khaled el Masri is at first a bizarre representation of a female fencer. But take a closer look at the skirt. The gold surface design is exquisite and will have been worked entirely by hand to perfectly fit the shape and fit of the skirt. There must be hours and hours of work in such a creation. And so I have come to realise that “haute couture” is playing a very important role in preserving exquisite craftmanship in a world where it might otherwise have disappeared completely. Without the rigorous standards set by the Chambre de Commerce et d’Industrie de Paris, the ateliers that produce exquisite work for a mere handful of designers (and only a few hundred customers) might have disappeared all together. And it is so important that we preserve these skills. I am passionate about sharing my love of embroidery because I love the simple rhythm of stitching and the joy of making something with my own hands. 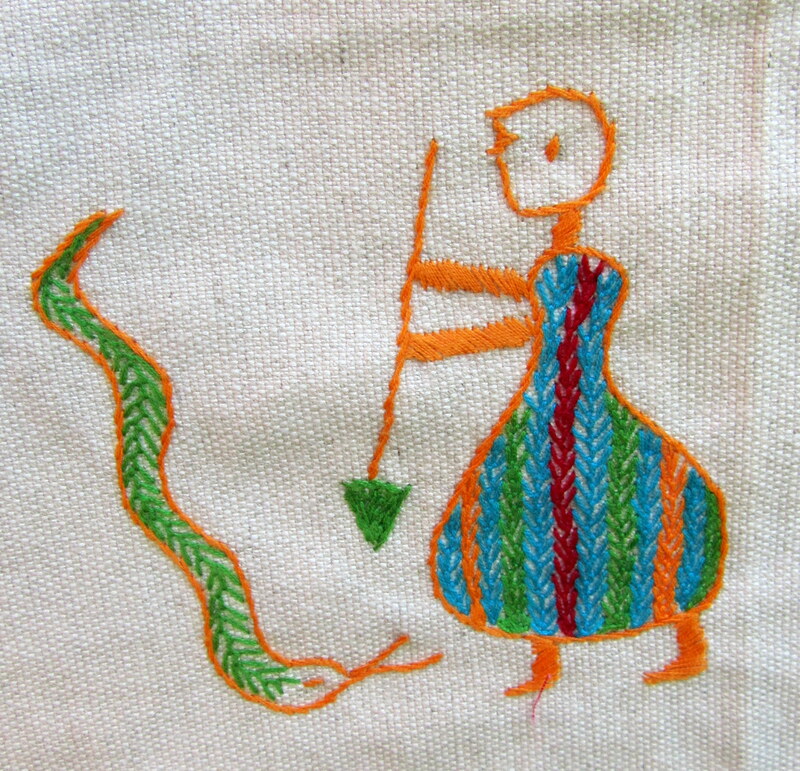 But nearly all my contact with embroidery to date has been as a craft or in the realm of textiles from around the world. To my shame, I hadn’t really stopped to think just how important it is to preserve the very highest standards of the art too. So, I have a new found respect for the world of haute couture. Long may it preserve the skilled art of embellishment with needle, thread and beads, as well as stretching the boundaries of what is possible! If you would like to see a whole range of images related to embroidery on clothing, follow this link to have a look at my Pinterest board. I have been making things (thinking 🙂 ) with my hands for as long as I can remember. 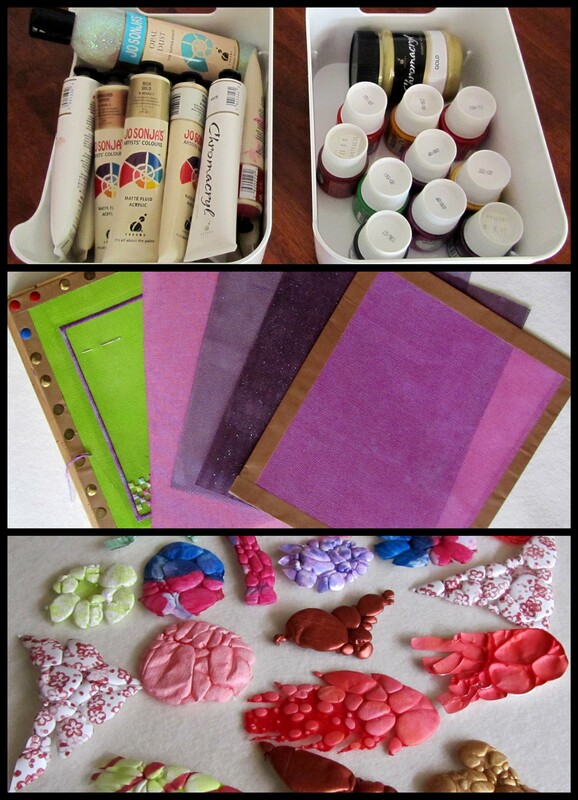 My childhood was punctuated with a succession of craft activities. My Mum introduced my sister and I to huck stitching, crochet, knitting, cross stitch, embroidery, making candles, macrame, making clothes (first for our dolls and then for ourselves), painting plaster moulds, making stuffed toys, collage and more. And these are just the ones I remember – there were almost certainly more! I simply can’t imagine my world without making something with my hands. It was such an absolutely fundamental part of my childhood. So, why was it so important then? Well, we moved a lot when I was a child. My Dad worked in the mining industry and thirty years ago there was no such thing as fly-in/fly-out. When Dad changed mines, we all went with him. In retrospect this was an amazing experience. But at the time every new move meant farewell to one group of friends and all the hard work of carving out our niche in a new home. Making things with my family provided a continuous thread through all these changes (did you notice my unintended pun there?). No matter what happened, there was always the excitement of pursuing a new handmade activity. And the satisfaction of creating something with our own hands. Our moves took us a long way from family, but every year our relations were treated to a new range of Christmas gifts from our home workshop. I’m not sure what they thought – but we loved it :). Every piece we made was imbued with an extra sense of purpose when it was destined for a treasured grandparent. As an adult, wife and mother, my life has continued to be punctuated by a series of moves around Australia and the world. Wherever I am living, making things with my hands (especially sewing as it turned out), brings exactly the same sense of satisfaction that I had as a child. I feel that same joy of disappearing into my own creative world for a few hours. 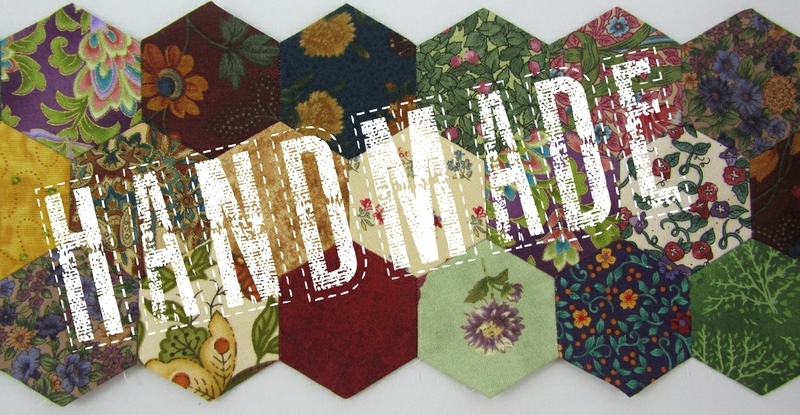 So, why is handmade so important to me now? I think it is because I know that wherever I am, I can find a measure of peace and security when I sit down to create. And then when a project is completed, I experience such a wonderful sense of satisfaction and joy. It really doesn’t matter whether anyone else likes my creation, because the process has already brought so much pleasure into my life. But perhaps more importantly, I have come to realise that I do a lot of thinking when I am creating. Working with my hands is such a peaceful and secure place for me, so I relax and think more clearly. And as much as I love modern technology – playing games on my iPad; catching up with friends on Facebook; browsing on Pinterest; or learning from TED – it is not a place where I can free my mind to think clearly. 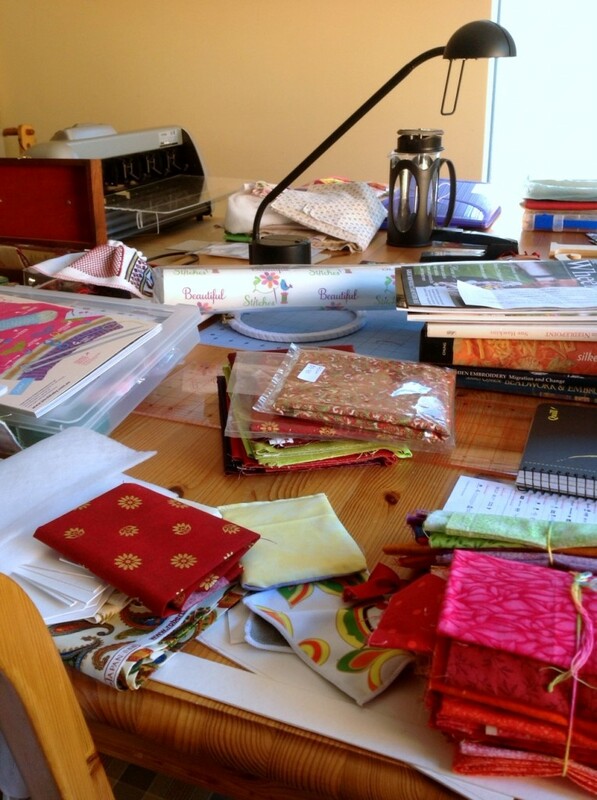 My creative time provides a real sanctuary in which to relax, think, and emerge refreshed. So go ahead and make some creative time for yourself. It might be something you have been doing for years or a brand new hobby that you have only just discovered. I guarantee that making time to “think with your hands” will bring an extra measure of pleasure to your life. Well my little blog has been taking an unexpected holiday again. As school holidays approached my daughter went down with a nasty bout of pneumonia and all my efforts seemed to be concentrated on keeping her comfortable. And then my son had a school trip snowboarding at Mt Hotham so my daughter and I headed to Cairns and Brisbane for a week. We had a really lovely time and I thought I would share some of the inspiration I found there. We were staying in a holiday apartment with my parents. We were on the 5th floor of our building, right on the Cairns foreshore. The views were stunning! In the evening we would generally take a walk along the boardwalk to buy an ice-cream. It was so much fun to pass people of all ages and nationalities, just sharing the simple pleasure of an evening stroll. Muddy’s Playground on the baordwalk in Cairns. At night, it took on an almost fairy-like quality. But the real surprise was the apartment itself. In this complex, each apartment is privately owned and decorated. We just happened to be in the apartment that had beautiful ethnic embroideries hanging on the walls, and splashes of colour and artwork everywhere. It was simply perfect for us because Mum and I are both passionate about embroidery. I felt surrounded and immersed in inspiration! An ethnic cross-stitch hanging on the wall of our apartment (behind glass so please excuse the reflections). 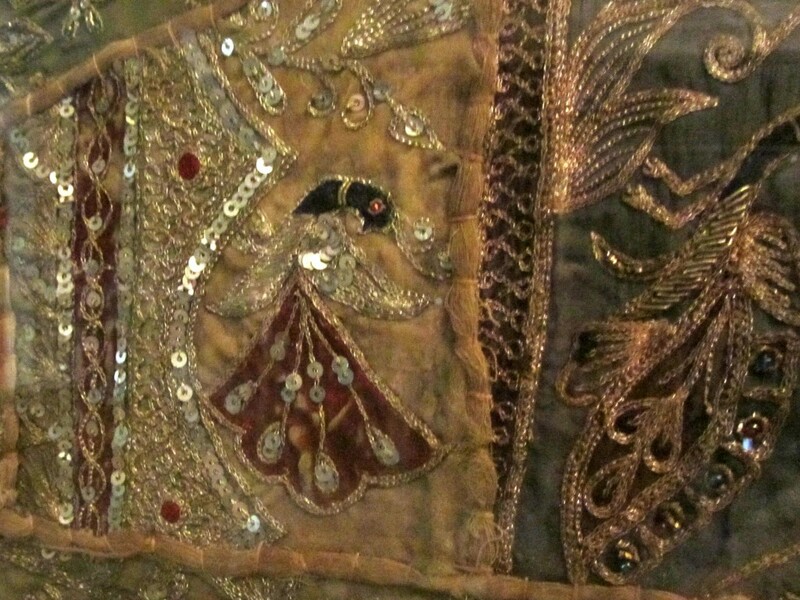 Another beautiful embroidery – this time in metallic threads and sequins (again behind glass – sorry). 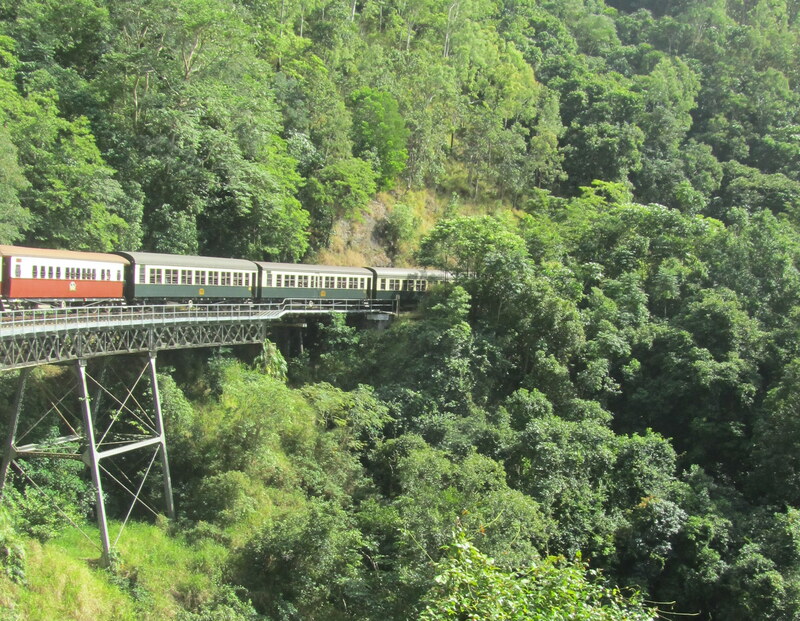 On Tuesday we took a trip on the world famous Kuranda railway. I love that spectacular hue of green you find in tropical rainforests. And we visited the Butterfly Sanctuary, which was simply enchanting. Our train disappearing into the tropical greenery on the Kuranda railway. 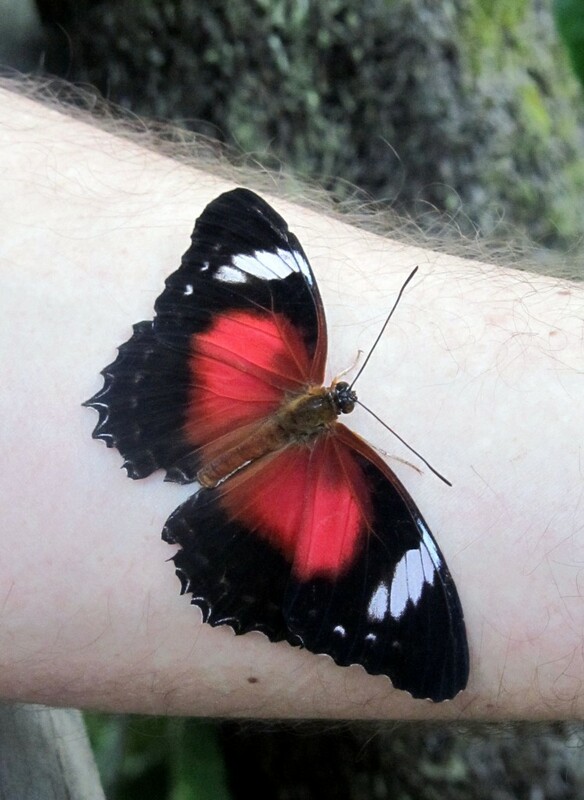 This beauitful butterfly landed on my brother-in-law’s arm – AND stayed there long enough for us to get a photograph. Wednesday found us on a boat to Fitzroy Island. We had such a lovely day just snorkelling and lazing on the beach. The idyllic beach at Fitzroy Island. The patterns in this old coral are wonderful. And then on Thursday we went shopping. My Mum had found Vivienne Francine, a Cairns based designer on their last trip and she knew that I would love her clothes. Well I confess I had a ball! I tried on eight or so dresses and I could easily have bought about six of them. But I had to get it down to two 🙂 Vivienne was lovely too. She has an amazing eye for colour – her fabrics are just stunning. I had sooooo much fun choosing – which is unusual for me because it is rare to find a shop where everything fits me so well and feels so right. In the end, Mum and Dad bought me one dress as an early birthday present and I bought one for myself. Now I just need the weather to get warmer in Perth so I can start wearing them! The funniest thing about this trip was that as usual, I had carefully packed a supply of sewing to keep idle hands busy…..and I didn’t work a stitch all week! I also took my knitting, and I think I managed about three rows 🙂 But sometimes it is good to give your hands and eyes a break, and this week I am full of enthusiasm and motivation again.